Ava & I. Being a feminist mother is a daily battle, especially when you are South Asian. Any woman can tell you that as a feminist, your morals and boundaries are constantly being challenged, and none more so than when you are both Asian and feminist. As with any culture, our traditions come laden with sexist traditions and customs, and if they are ones that we grew up with, it can make the lines between passing things onto our own children, or not, all the more blurred. As a Bangladeshi feminist working wife and mother, I have more than my share of explaining why I am raising my daughter to be an independent young woman instead of one who studies Bollywood movies for moral direction. Being a South Asian feminist mom is a daily battle, but more so with others than with myself. 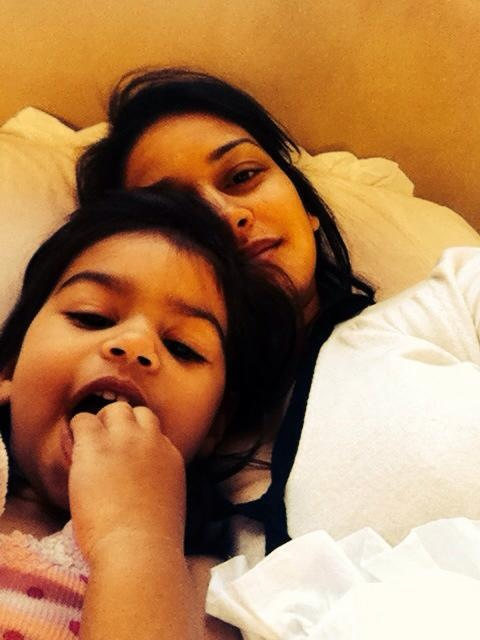 Below are the top five lessons I have learned about being an empowered South Asian mother. One of the greatest pressures I felt after my daughter was born was to breastfeed her. Although I had no issue with milk supply, or Ava latching on, I developed major thyroid issues. Month to month my medicine doses increased. After three months, my doctors told me to switch exclusively to formula for my baby’s health. The news of me giving my newborn only formula instead of only breast was the end of the world according to many in my extended family. People could not believe I would “pump my baby with chemicals.” A lot of family members also thought formula was totally unsafe altogether, and just out of the question. I listened to my doctor. Though I understood concerns family could have had about formula, they had their kids in the 1950s. We were in the new millennium now. Formula let me get sleep, let my husband bottle-feed, and I got to go back to work as soon as my leave ended. Biggest bonus? My baby was super-healthy, and I would do it all again. Even though it is 2014, I believe secretly more women experience ‘bad-mommy’ guilt for continuing to work, regardless of their financial situations. I can’t tell you how many times throughout my pregnancy people asked me if I was going to stop working, while not once did my husband get that question. Whenever my facial expression dropped to my “why in the world would I ever stop working?” face, I almost always was made to feel like a selfish mother. Aside from letting me continue to build my career, going back to work gave me sanity. As hard as it was in the beginning, I was quick to see the benefits of having a job after becoming a new mother, and I believe it’s just as beneficial for your baby. • A Nanny Can Be a God-sent If you come from a South-Asian family, chances are they’re going to want to have family as childcare. But that’s exactly where many problems with your extended family can start. I count my lucky stars looking back that I stuck to my guns about hiring outside paid help. Whoever looks after your kids while you’re not home, has to listen to the mother, and with family you are not always heard. My nanny became my second-wife. She was an excellent partner to both my husband and I, instrumental in making us stronger together as parents. I write a lot about the long-term harmful effects of princess culture on our daughters, and it remains an issue I am fascinated with. When I discourage princess gifts and toys for Ava to family and friends, people think I am ruining all the fun. But I stick to my beliefs. As a feminist, I just cannot watch others label my daughter, and subconsciously encourage her to grow up to be a woman who dreams of being saved by a man. People will tell me to relax my feminist policing, but I stick up for teaching my daughter that life is about being able to 100% rely on yourself. *This post was published on Masala Mommas, Forbes Woman & The Huffington Post Canada.